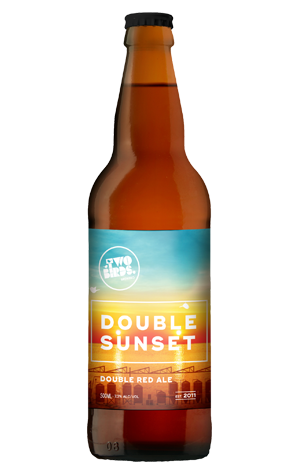 In the winter of 2016, Two Birds released Double Sunset – a souped up take on their Sunset Ale – as a celebration of their twin wins at the Australian International Beer Awards (Champion Brewery and Champion Amber/Dark Ale for the Sunset. The beer proved rather popular and not just with drinkers – it's the in-house favourite of the head brewers too. So now it's back and it's been bottled too. If you're unfamiliar with either Sunset, the original is a well balanced, hoppy red ale and the Double is, well, the same but more of everything: heaps of specialty malts and twice the amount of Citra, Galaxy and Cascade hops. For all the hopping, however, it's the toasted toffee that dominates the aromas rising from this ruby chestnut beauty. There's lively tropical and citrusy hop flavours, some stewed fruits joining the party too, and a gentle warmth that builds over the course of a 500ml bottle, before you're left with a lingering, bittersweet aftermath.